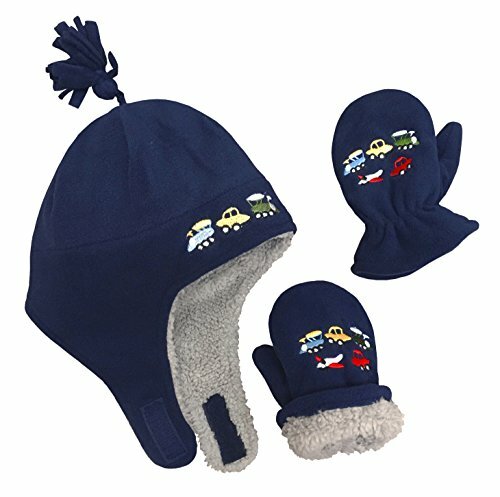 N'Ice Caps boys trains/planes/cars multi color embroidered sherpa lined micro fleece hat and mitten set will be sure to keep your child warm this winter! Adjustable velcro chin strap, elastic on mitten wrist, hanging tassel on hat. Color options: black/multi, navy/multi, charcoal/multi, royal/multi, black/grey tye dye. 5 sizes available: 3 months; 3-6 months; 6-18 months; 2T-4T; 4-7 years. For infant sizes up to 18 months, the mittens do not have thumbs. For the larger sizes 2T-4T and 4-7 years, the mittens have thumbs. Tested and approved as per CPSIA standards.